This problem keeps coming up in the projects I work on. I create a model that predicts how many orders a customer will place in the next month. Then, I create a model that predicts how many days (called "monthly visits" in this example) a customer will visit your website next month. Finally, I segment customers based on the two predictions. The lower left cell (green) represents customers who are unlikely to purchase, and are unlikely to visit. Notice that this cell has the second best daily conversion rate (purchases / days visited). The upper left cell (orange) represents customers are are likely to purchase, but are unlikely to visit. Notice that this cell has the best daily conversion rate (5.5%). In many ways, this is the customer your visit-centric metrics are trying to optimize ... their conversion rate is good, but they don't use your website much. The lower right cell (blue) represents customers who are not likely to purchase, but are likely to visit. 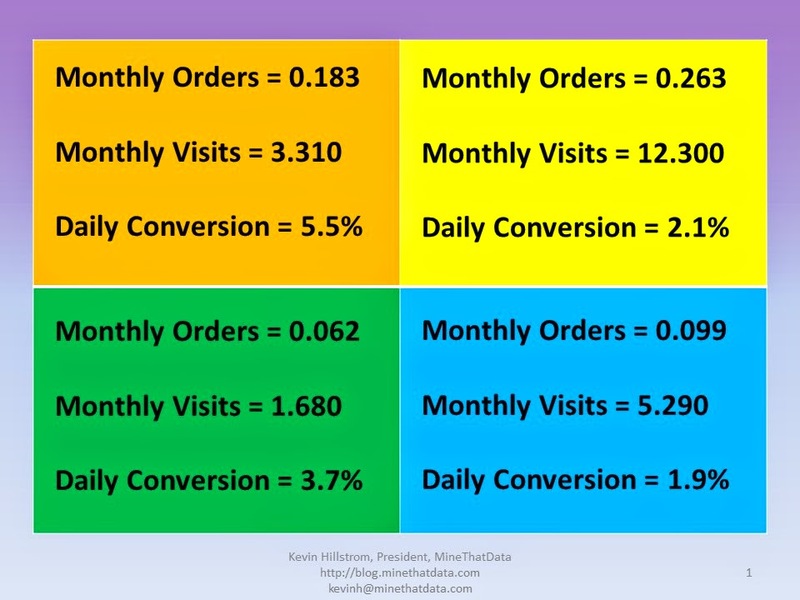 You'd expect a lousy daily conversion rate, and you get precisely that (1.9%). Marketers HATE this cell ... they do anything they can (discounts/promotions/begging) to get this customer to purchase. You won't get this customer to purchase ... this customer likes to visit, to browse. The upper right cell (yellow) represents customers who are likely to purchase, and who are likely to visit your site often. This is the dream customer - fully engaged with the site and very willing to purchase. What is the daily conversion rate for this segment? A paltry 2.1%. Your best customers have horrible conversion rates, in this example (happens all the time, folks). Your staff will work overtime to get the customers in the upper right quadrant to purchase NOW!! Cart abandonment programs, programmatic approaches & retargeting, keyword bidding, discounts/promos in email campaigns. STOP IT! Just STOP IT! These customers already love your brand - they just love it so much that their visits overwhelm their purchases. You DON'T CARE that this customer has a low conversion rate ... so what?! Collect the profit. Show of hands ... how many customers do you have that fit into each cell above? If you don't know the answer, send me an email (kevinh@minethatdata.com) and I'll get busy creating the cells for you.